Author/Creator : Matthew Heiti (harkback) all credits goes to him. Thanks to any and all for taking the time printing and playing this scenario. It was a lot of fun to craft. “Place the set-aside Stygian Grotto location into play. Move all investigators and enemies from Kingsport locations to the Stygian Grotto. Apologies for this oversight. This tweak will be included in a final version, once I’ve collected more feedback from players. Now updated with version 1.3, fixing some poor wording on cards. Congratulations Matthew for this scenario. I’m a member of the french community “Horreur à arkham jce”, we are looking for fanmade scenarios that we could translate to increase the number of adventures available in french. Would you allow us to translate this adventure for french-speaking players ? It would be great to see this scenario in French! I would be happy to send you the files/card images. You can email me directly at matthew.heiti@yahoo.ca and let me know if you’d like individual card images or the Strange Eons files. first of all, great scenario! Any chance you can upload the card images as well? I’d love to translate this into Italian, and I need the images to recreate every card… can you help me? For the record, I’ve also translated another scenario called The Grand Oak Hotel! Ciao Alessio. Leggo che hai tradotto lo scenario del Grand Oak Hotel. Dove posso trovare i link per il download? Io ho tradotto gli scenari “the collector” e “the curse of amulotep”. Ho inviato i file all’admin così li può caricare sul sito. Sarei contento di poter collaborare con te nella traduzione di altri scenari, così da dividere il carico di lavoro. Ciao Andrea, grazie per il tuo messaggio! All’interno del pacchetto trovi anche una mia dichiarazione che ti autorizza a farne qualunque uso purché non commerciale (facendo il traduttore di lavoro, mi sono dovuto tutelare…). In ogni caso, se ti va di collaborare fammi sapere a quali scenari ti piacerebbe lavorare! Thanks for this wonderful scenario of one of my favorite HP Lovecraft stories. However I need some help. Act 2b reads: “If the investigators haven’t found a seal ring, return to Act 4a”. Does it really mean “Act 4a” or is this a mistake? I guess it’s “2a” or rather “1a”, right? Hi Manuel – thank you for the kind words and for taking the time to print and play this scenario! Let me know if you have any other questions! Let me know how the experience went! Printed off your scenario and failed miserably!! Really enjoyed it though and looking forward to giving it another go. Hi Billy – Thanks for giving it a try! Hope it works out better for you on the next go, and do let me know if there is anything that doesn’t jive. For the cover page card, I used the “Labyrinths of Lunacy” scenario pack cover and just altered it to suit. Although the result isn’t perfect! If you search “Arkham Horror Scenario Cover” you should find a few options. Hope that helps! Superb looking artwork and lay-out. 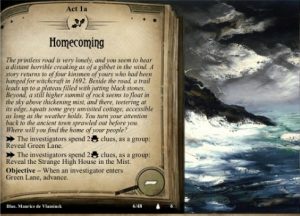 Once I’m done with the Dunwich cycle, I will definately give it a try! Stefaan – Thanks for taking a look and for the supportive words! Let me know how the play goes, when you have the time! Which location do you start on? Orange Point is the starting location. Hi there. All cards are connected with front and backs adjacent, beginning at the left edge of the page. So, for example, the first sheet: the scenario cover (front) and “The Festival” card #1 (back) go together. And so on, all the way through. Let me know if that clears things up for you.